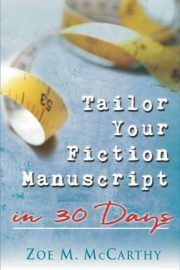 Zoe McCarthy’s book, Tailor Your Fiction Manuscript in 30 Days, is a fresh and innovative refocusing of your novel or novella. Through a few simple—and fun—steps, Zoe helps writers take their not-ready-for-publication and/or rejected manuscripts to a spit-polish finish. Writing is hard work, yes, but it doesn’t have to be difficult. —Eva Marie Everson, best-selling and multiple award-winning author, conference director, president of Word Weavers International, Inc. If you want to increase your chance of hearing yes instead of sorry or not a fit for our list at this time, this book is for you. If you want to develop stronger story plots with characters that are hard to put down, this book is for you. Through McCarthy’s checklists and helpful exercises and corresponding examples, you will learn how to raise the tension, hone your voice, and polish your manuscript. I need this book for my clients and the many conferees I meet at writer’s conferences around the country. Thank you, Zoe. A huge, #thumbsup, for Tailor Your Fiction Manuscript in 30 Days. Tailor Your Fiction Manuscript is a self-editing encyclopedia! Each chapter sets up the targeted technique, examples show what to look for in your manuscript, then proven actions are provided to take your writing to the next level. Whether you are a seasoned writer or a newbie, you need this book! After five years, Trace McMillan hasn’t moved on from his deep grief over his wife’s death. 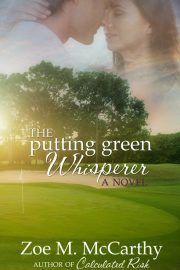 At his grandmother’s funeral, an unfamiliar mourner’s presence shocks Trace and forces him to begin the healing process. Lattice Stone’s grandmother has influenced the person she is. Lattice resolves to travel a better path than the damaged road her grandmother’s guidance offered. It’s not easy when her new job puts her in the company of a man who seems to dislike her for no apparent reason. The story is set on a cattle farm in the Blue Ridge Mountains of Virginia with a resident pig. Four-hundred-pound Picasso plays his part in bringing the unlikely lovers together. 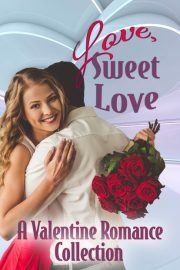 Five sweet romances by five authors in one collection, Love, Sweet Love. The novellas are: Landing in Love by award-winning author Mary Manners; Like a Dance by Delia Latham; Her Valentine Vet by Dora Hiers; Good Breaks by Zoe M. McCarthy; and Heart of Hope by Tanya Hanson. Life has dealt Jassie Kinnamon bad breaks. Her hardships have shaped the mammography tech into a woman who desires to fix other people’s situations. After her last tragedy, she left the ski community of Denver for Birch Gap, a small ski town in the Blue Ridge Mountains of western North Carolina. Jassie is fasting from romantic relationships and puts all her energy into her job, detecting breast cancer. Entrepreneur Connor Noble has had bad breaks of his own. He has also moved from Denver’s skiing scene to Birch Gap. For the love of a woman—a much older woman—Connor has brought a huge responsibility with him to Birch Gap. A new bad break introduces Jassie and Connor. The love of skiing and first-hand knowledge of ski resorts in the West seems to be the only things they share in common until Jassie offers to help Connor with his responsibility. He cautiously accepts her kindness. Too often for Jassie’s liking, they are thrown together at Connor’s chalet. Jassie tries to resist her growing feelings for Connor and deal with trust issues she prays about. Will Jassie break her fast for Connor, or will she try to fix his flaws? Candace Parks lives a passionless life in Richmond, Virginia. The computer programmer returns to the empty family home in the Blue Ridge Mountains to evaluate her job, faith, and boyfriend. 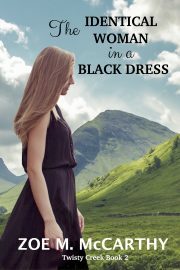 Her high school crush, star football player and prom king Trigg Alderman, is in Twisty Creek visiting his grandmother who lives next door to Candace’s family home. He doesn’t recognize her at first and remembers little about her. He’s not alone. Candace’s rekindled attraction to Trigg adds unexpected complications to finding her passions. Sorting her life out? How about nothing of the sort! Amanda Larrowe’s lack of trust sabotages her relationships. The English teacher and award-winning author of middle-grade adventure books for boys has shut off communication with friends and family to meet her January 2 book deadline. Now, in the deepest snow accumulation Richmond, Virginia has experienced in years, Camden Lancaster moves in across the street. After ten years, her heart still smarts from the humiliating aftermath of their perfect high school Valentine’s Day date. He may have transformed into a handsome, amiable man, but his likeability doesn’t instill trust in Amanda’s heart. When Cam doesn’t recognize her on their first two encounters, she thinks it’s safe to be his fair-weather neighbor. Boy is she wrong. 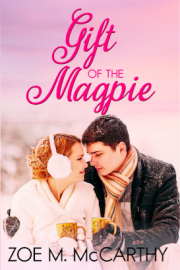 In Gift of the Magpie, writer Amanda Larrowe finds herself with a pressing deadline, a new neighbor and an old grudge. But Christmas has a way of sweeping in with surprises, and Amanda soon discovers that there’s more than one way to end a story. 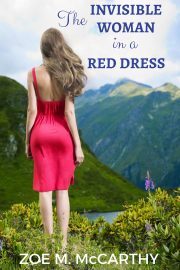 This fast-moving, lighthearted romance will hold readers in its grip to the very last page. When the doorbell rings and you’re in your snowman jammies and the guy who humiliated you ten years ago stands on your doorstep looking more handsome than ever . . . it’s a sure set-up for a second chance at love. 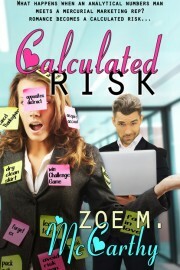 Once again, Zoe M. McCarthy gives us a fun and cozy romance as satisfying as a cup of homemade hot chocolate. —Becky Melby, author of the Lost Sanctuary Series and Do You Know What I Know? Whoever said opposites attract was right, of course…but no one ever said what they attract. Jilted by the latest of her father’s choices of “real men,” Cisney Baldwin rashly accepts an invitation to spend Thanksgiving weekend with a sympathetic colleague and his family. Nick LeCrone is a man too much her opposite to interest her and too mild-mannered to make her overbearing father’s “list.” Now, Cisney fears Nick wants to take advantage of her vulnerable state over the holiday. Boy, is she wrong. Nick wants little to do with Cisney. She drives him crazy with all her sticky notes and quirks. He extended an invitation because he felt sorry for her. Now he’s stuck, and to make matters worse, his family thinks she’s his perfect match. He’ll do what he can to keep his distance, but there’s just one problem—he’s starting to believe Cisney’s magnetism is stronger than he can resist.